Semiannual Base Inspection – Peninsula Moves! 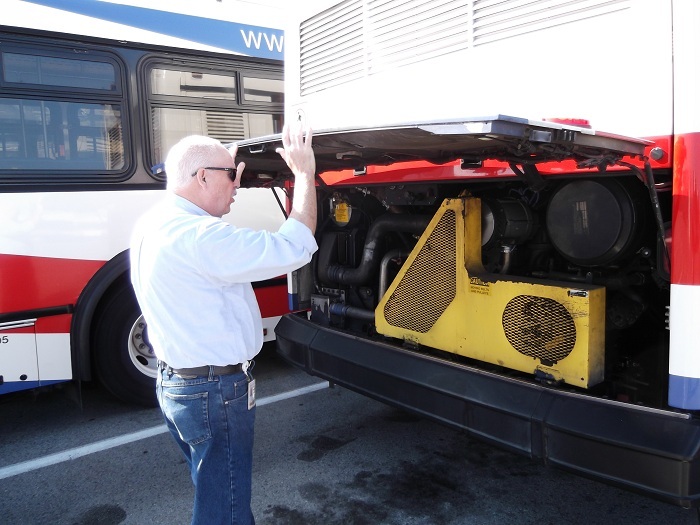 SamTrans Deputy GM, Chuck Harvey, examines the engine compartment of a bus during base inspection. The days of putting on a white glove and checking the tops of door jambs for dust are over at SamTrans. But only just barely. Meticulous attention to detail—making sure that everything is clean, safely put away, and in proper working order—has long defined the semiannual maintenance inspections that SamTrans carries out at its operating bases in South San Francisco and San Carlos. The inspections regimen was started in 1983 by John Ficarra, a military veteran who sought to instill the same discipline and attention to detail at SamTrans that he learned as a member of the armed forces. As the Deputy General Manager of Transit Operations, Ficarra would personally lead the base inspections, which are carried out every April and October at the two facilities, which house and maintain SamTrans fleet of buses. SamTrans South Base Bus Operations and Maintenance Facility was named for Ficarra upon his retirement from the District. Now the reviews are carried out by Chuck Harvey, SamTrans’ Deputy CEO of Operations, Engineering and Construction. While Harvey doesn’t conduct the inspections with quite the same military zeal as his predecessor, the base checks he oversees systematically account for every part of the day-to-day operations at SamTrans. The locker rooms and lounge areas are scoured for even the most remote signs of dirt. The ceilings, floors and walls are eyeballed up and down, to insure that there is no paint peeling or discoloration. Harvey reviews tool inventories to make sure the right resources are available for SamTrans’ mechanics and observes the lighting in the garage to check for any burned-out bulbs. Safety is the primary concern at SamTrans, so Harvey dedicates a significant portion of the inspections to ensure that there are no work hazards, broken pieces of equipment or misplaced items in the garage. Out in the operating yard, Harvey randomly checks on an array of different buses, all from different manufacturing series. He inspects the interiors for cleanliness and checks out the engines to make sure there is no muck or grease on the essential parts. 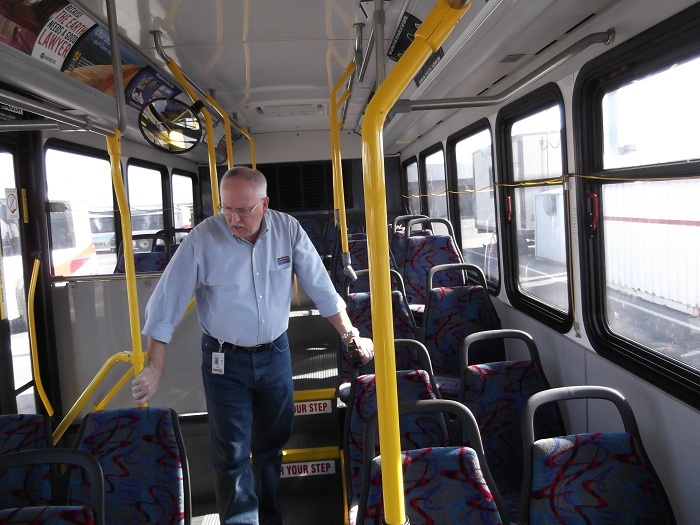 SamTrans deputy CEO, Chuck Harvey examines a bus during base inspection. Accurate record-keeping is also a major goal of the SamTrans’ mission. Harvey reviews preventative maintenance reports , to determine if mechanics are making the required routine checkups on the buses. Preventative maintenance with buses, as with personal cars, is one of the most critical components of keeping a vehicle operating in safe condition for maximum longevity. Harvey also emphasis ongoing improvement through what the Operations team calls its ‘commitment to continuous improvements.’ As part of this effort, Samtrans workers fabricate specially designed tools, which are used to make their jobs safer and more efficient. The semiannual base inspections aren’t part of a federal requirement or a state mandate. They’re carried out because they reflect the “SamTrans way”—a dedication to customer service and safety.